Only 2 SEL Plus models left in stock! 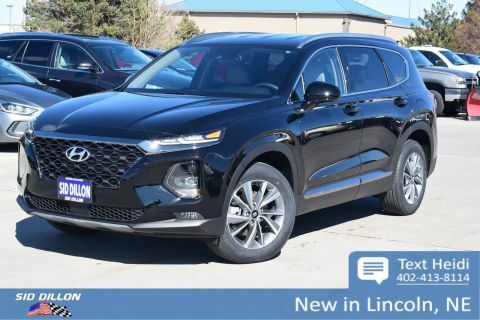 Trustworthy and worry-free, this 2019 Hyundai Santa Fe SEL Plus lets you cart everyone and everything you need. Tire Specific Low Tire Pressure Warning, Side Impact Beams, Rear Child Safety Locks, Parking Distance Warning Rear Parking Sensors, Outboard Front Lap And Shoulder Safety Belts -inc: Rear Center 3 Point, Height Adjusters and Pretensioners. Wheels: 18 x 7.5J Alloy, Wheels w/Painted Accents, Variable Intermittent Wipers, Valet Function, Trunk/Hatch Auto-Latch, Trip Computer, Transmission: 8-Speed Automatic w/SHIFTRONIC -inc: lock-up torque converter and manual shift mode.